Expect 25 to 30 casks to be pouring over the weekend, 12 at a time, including rare offerings not normally seen in cask in NYC. 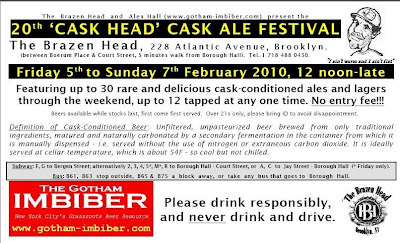 Beer range is courtesy of Alex Hall (gotham-imbiber.com) in conjunction with Lou Sones, the Brazen Head’s manager. Beer will come in half pint and 16 oz measures, there’s no entry fee and you pay by the glass. Opening hours: Noon to 2 AM all three Days. Since this 3-day festival ends on Super Bowl Sunday, The Brazen Head will be showing the game and offering $1 off all cask ales during the game, and will serve complimentary chili (traditional & vegetarian) from 6pm.